South Africa rapidly heading down the gurgler. Time for NZ to cut sporting links with the Republic I think. Havana, Aug 25 Cuban Foreign Minister Felipe Perez Roque met Monday in Havana with his South African counterpart, Nkosazana Dlamini Zuma, to discuss bilateral relations. Perez Roque welcomed Zuma at the Cuban Foreign Ministry headquearters. 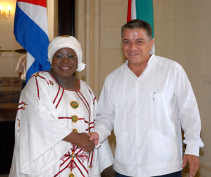 During the meeting, the Cuban official thanked the South African government and people for their solidarity towards the island state. He also praised the active role the African country is playing within the Non Aligned Movement and the United Nations. Current international issues as well bilateral cooperation were also addressed by the two ministers. Cuba and South Africa have similar approaches to various issues collectively embodied in the South agenda, with both countries advocating for increased cooperation amongst countries of the region and a redefinition of relationship between the North and South. Bilateral relations are strong, dating back to the prominent and decisive role played by Cuba in the struggle and victory against Apartheid and colonialism in South Africa. Zuma began her official visit after presiding over the regional conference of South Africa"s ambassadors and high commissioners based in the Americas and the Caribbean, held in Varadero, Cuba. She is also scheduled to meet Cuban Minister of Foreign Investments and Economic Cooperation Marta Lomas Morales.